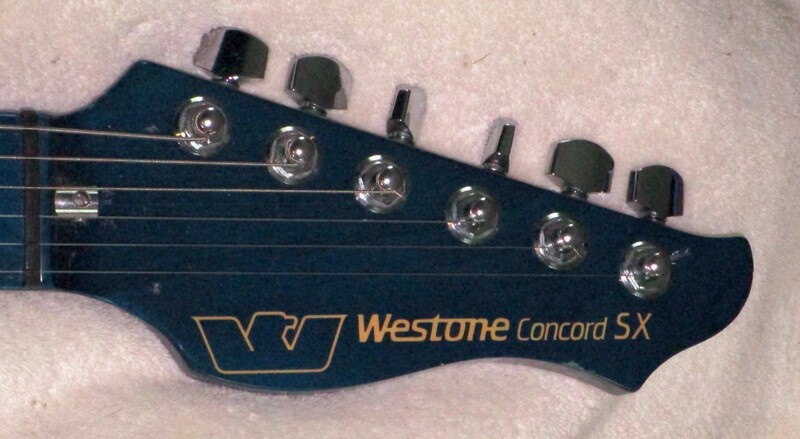 Up first is a 1984 Westone Concord SX in blue. Everything is blue, even the fretboard. Apparently, this particular model was only made for 1984. I believe blue is the most common color. It was also available in red, and possibly black. 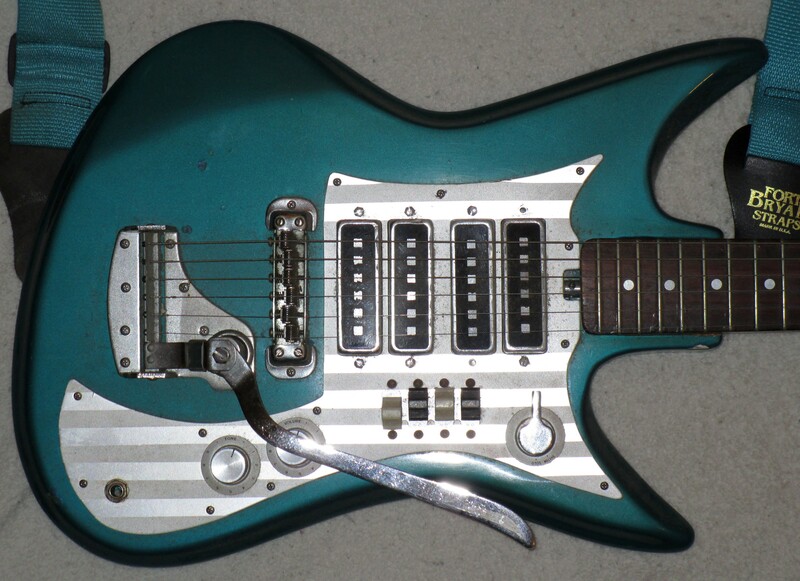 It’s sort of a “Super Strat meets Gibson SG” thing. It evolved into the Spectrum series. Matsumoku Industrial was a Japanese woodworking company established in 1951. 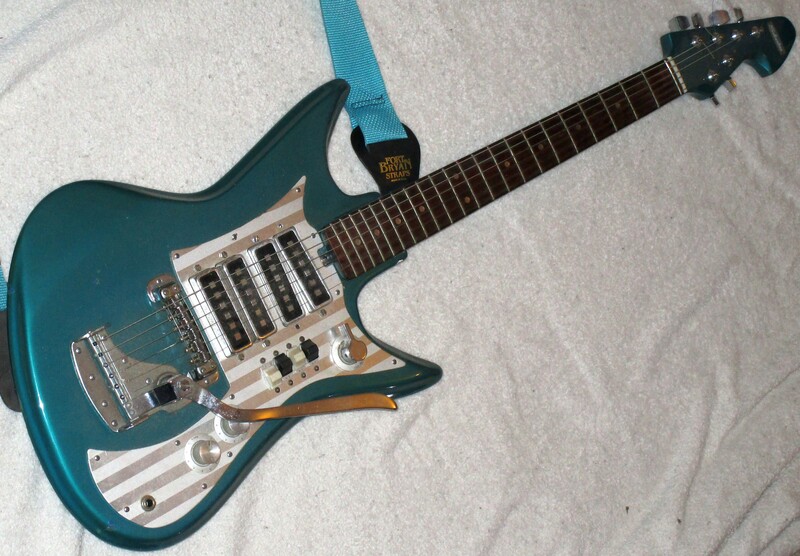 They began making guitars in the mid 1960s to diversify. At first, “Uncle Mat” made guitars as a subcontractor for various companies like Epiphone, Univox, Aria, and Electra. Then the Westone brand name was started around 1979 to sell directly to the public. In the early 1980s, St. Louis Music decided to discontinue their Electra brand in favor of the Westone name. Apparently Matsumoku were making most if not all of their Electra models by this point. Matsumoku went belly-up in 1987 when their parent company, the Singer Corporation, faced a downturn in sales because people suddenly realized that it was the 1980s and you didn’t have to make your own clothes anymore. Apparently the potato sack dress went out of fashion? 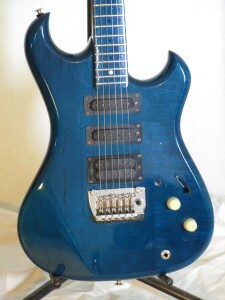 Plus, most of Matsumoku’s major guitar customers had started their long “screw quality” march and moved their overseas production to Korea. I picked this guitar up on Ebay for $350. I had my eye on it for over a month before deciding to take the plunge. It seemed awfully expensive for a no-name guitar in mediocre condition. Then, when I went to buy it, I saw a similar model in red for less than half the price. Then I bought both because I have a credit card! This particular model is missing the volume control pot. A previous owner has helpfully put a small pen cap or something in the original hole to plug it – how thoughtful! The first tone control has been rewired as the volume control, and the second pot doesn’t always work. The original knobs are long gone and the 5 way switch is finicky. Overall, the guitar sounds… nice. Not thrilling, but nice. This guitar allegedly has the UBC – UnBalanced Coil humbucker. Maybe someday I’ll measure it to find out if it actually is or not. Right now, I’m surprisingly happy with that pickup. Most humbuckers sound lifeless to me, but this one is punchy, with lots of definition. You can actually hear the different strings! Too bad the single coils are hopeless. And oddly shaped too – good luck getting decent replacements! Lace Sensors are the only ones I like that will fit with no routing, but they don’t even look close to stock. I’d rate the bridge pickup around 8/10, and the shrill single coils around 2/10. This is the Bendmaster FT locking trem. The string’s ball-ends simply slip into place from the top – nice. I don’t have the arm for it, so I have no idea how well it works. At least it stays in tune during my heavy-handed pummeling. The neck is completely blue, just like the body. It feels fantastic. Very similar to a quality Fender. The neck is properly wide, but not very deep, like an 80’s Ibanez, or a Warmoth “Wizard” profile. But it feels like it has a more Fender-style radius. I haven’t measured it, but I’d guess it’s around 9 or 10 inches. Mine only has a single white dot position marker, which appears to be a vinyl sticker. I guess the others peeled off. 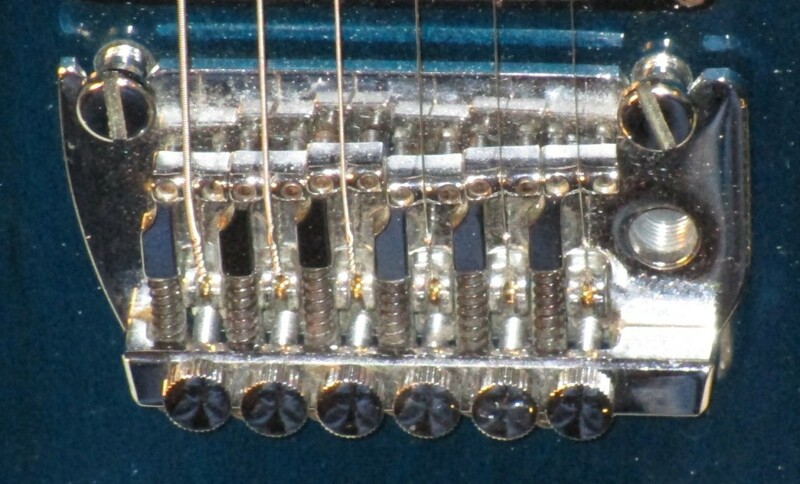 What’s left are small black dots, like the other Matsumoku guitars from the period. The frets are very small. 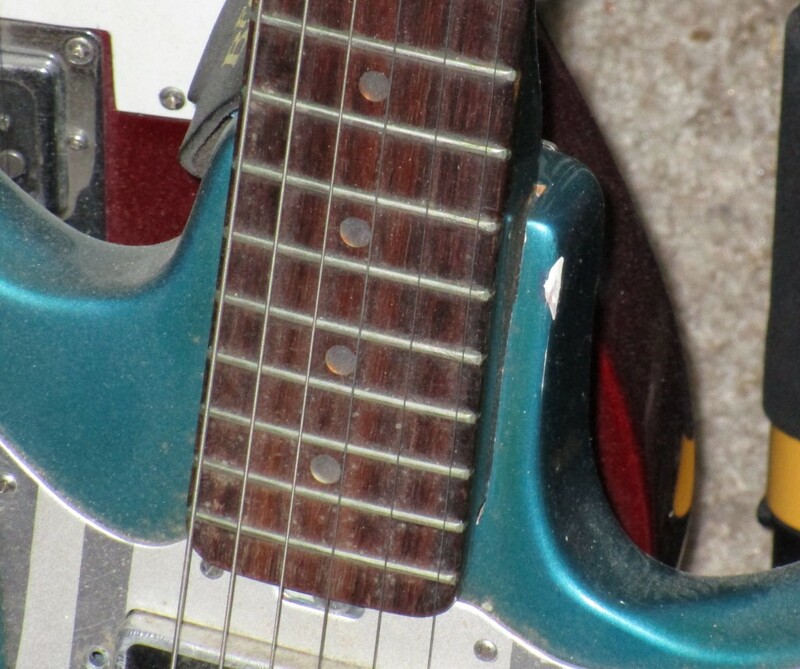 Hammer-ons and pull-offs can be tricky, limiting this guitars usefulness to shredders. 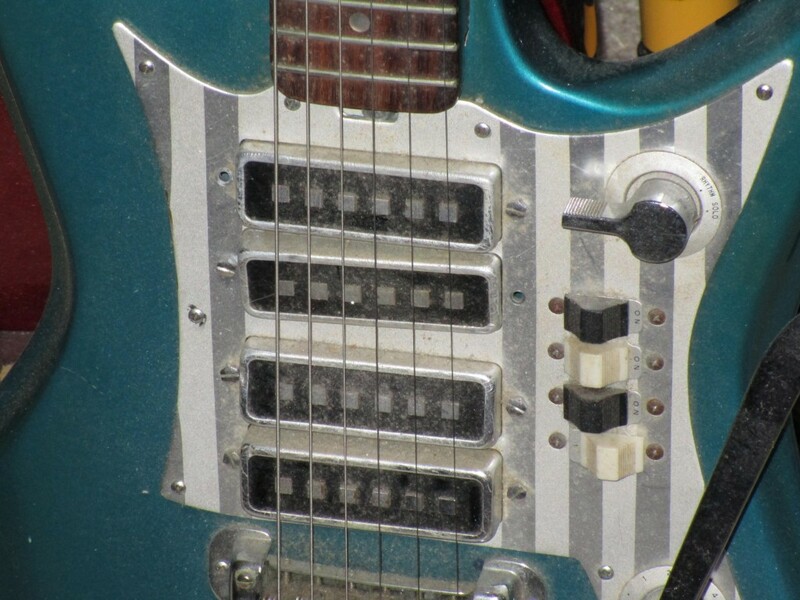 That’s an odd design choice, given this guitar’s “Super Strat” leanings. I don’t mind – I’m all about bar cords. For me, I’d rate the playability 10/10 for rhythm, but only 6/10 for lead. The locking nut is missing. Well, it was not a proper locking nut – it was simply a string lock that mounted behind the nut. 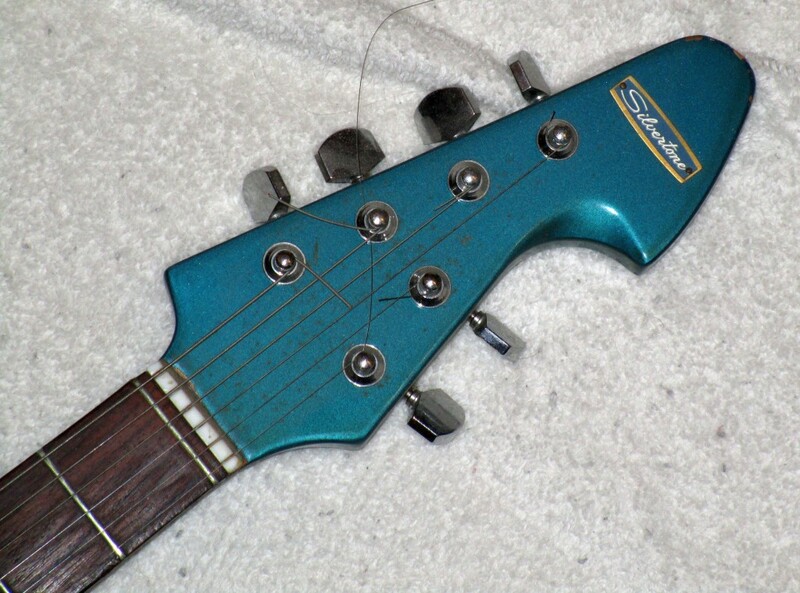 The tuners have been replaced with non-locking Sperzels. There’s no string tree, but the high strings don’t seem to be popping out. With a little work, this will be an excellent axe. Posted in Japanese. Tagged Concord SX, Japan, Matsumoku, Super Strat, Westone. I don’t have my camera with me, so I was going to start by using some photos I already had of my guitars, maybe some from my old site, maybe some that I took for the Couch, but they are all HORRIBLE. 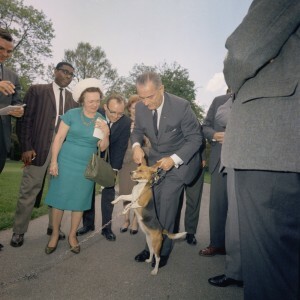 Instead, here is a picture of LBJ holding a beagle by the ears.